The Android tablet PC market is extremely competitive with new products constantly being released especially at the lower end of the spec range. That’s not to say that there isn’t some great devices to be had at some ridiculously low prices, and now the HP Slate 7 price reduction fires a broadside across the Nexus 7. While the Nexus 7 may now be celebrating its first birthday with a new model on the horizon it is still the market leader when it comes to 7-inch Android slates, but HP has upped the ante with a price reduction on the HP Slate 7. The device only become available back in April but now you can pick up the 8GB version for only $139.99 or the 16GB model is priced at $169.99. This works out at a saving of 17.6% for the 8GB or 15% for the 16GB model, and at the time of writing the price reduction is only affecting the US market with pricing still at the original level on the UK HP store. There isn’t any indication if this is a limited time offer or a permanent price cut but for your money you get a 7-inch display at a resolution of 1024 x 600, which is powered by a dual core ARM Cortex 9 processor clocked at 1.6GHz with 1GB of RAM. The device is also running the Android 4.1 Android Jelly Bean operating system and comes with a 3-megapixel rear camera along with a VGA unit around the front. While some of the specifications for the HP Slate 7 don’t quite match up to the Nexus 7, it does have that all important microSD card slot for extra storage, and is now quite a bit cheaper. 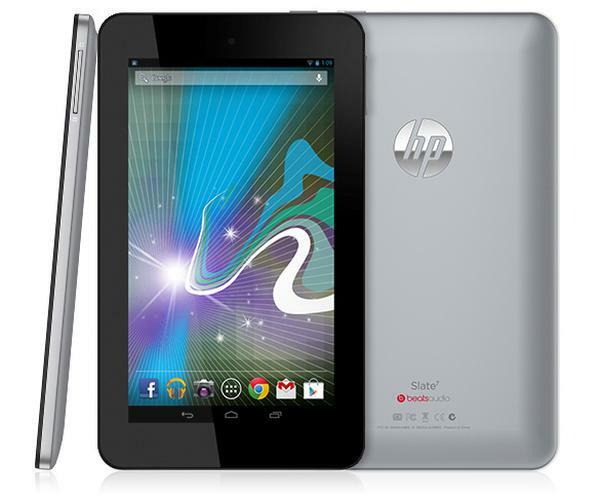 Is this price drop enough for you to consider the HP Slate 7 now? I’m just going to copy and paste my response from a similar article. Something about Hewlitt-Packard just says to me; “Desperate”, not this price drop, but the company itself. Staples has the Nexus 7 for $179.99 on sale.